The NCAA just announced that Vitaminwater, a product produced by long time corporate sponsor Coca-Cola, may put student athletes at risk of failing a drug test in the context of an NCAA championship event. 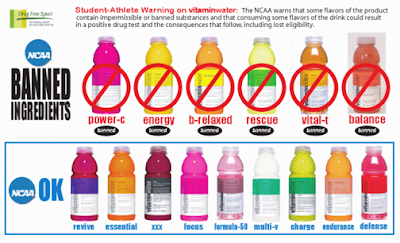 Although the press release indicates that, "normal daily consumption of any of the 13 Vitaminwater varieties will not place a student-athlete at risk for testing positive for banned substances", the legalistic language around the issue warrants additional reading by compliance and medical staffs. Lastly, two of the varieties, "Energy" and "Rescue" contain caffeine and/or guarana seed extract that could result in a positive drug test under certain conditions. According to the release, "an average sized healthy man would have to drink ten 20 oz. bottles of Vitaminwater Energy or Rescue within several hours of competition to reach the level that could potentially create a positive NCAA urine test." Obviously smaller athletes would have to drink less. Trying to educate about which of these varieties is permissible (the graphic shows how similar many of these products are in appearance) will complicate educational efforts around substance abuse as well as prompt questions about appropriate hydration for athletes. It also points out the challenges of even the most well conceived corporate sponsorship since the brand will receive prominent placement behind the benches at the 2009 Men's and Women's Basketball Championships and the Final Four. Many will thirst for clarity. Dasani anyone?